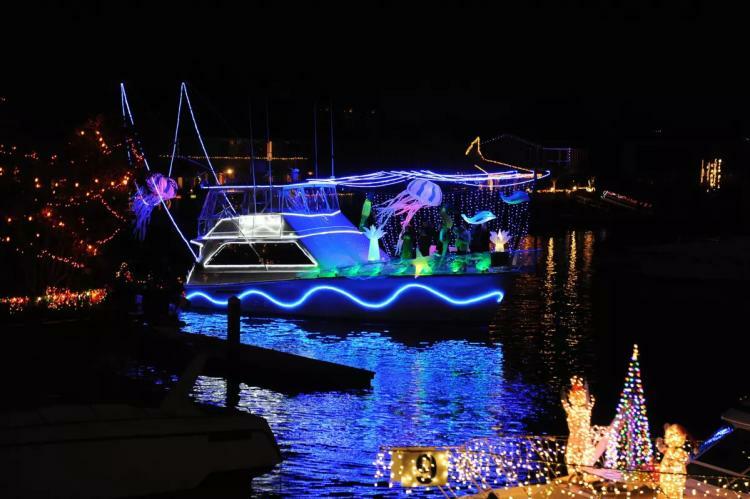 Bring the family and enjoy a magical night to remember at the 54th Annual Huntington Harbour Boat Parade and Cruise of Lights®. Enjoy the show. You won’t miss the snow! 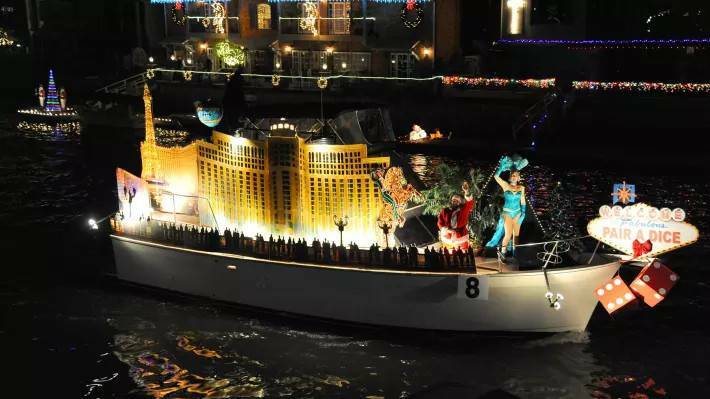 What began with twelve boats more than half a century ago now includes more than 75 luminescent floating vessels and a holiday light show extravaganza. The Huntington Harbour Philharmonic Committee came up with the original idea for the event as a fundraiser to help support the music education of Orange County school children. To date, more than four million children, from kindergarten through high school, have participated in the educational youth programs paid for with proceeds from the Cruise of Lights®. 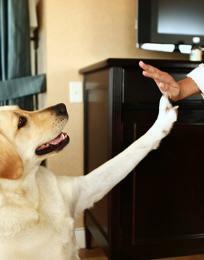 December 10-11 from 5:15 p.m. to approximately 8:30 p.m. This beloved holiday tradition is held the weekend before the Cruise of Lights as a ‘thank you’ to the homeowners of Huntington Harbour for decorating their homes. ‘Symphony of Lights’ is this year’s theme, and there will be an array of music and lights representing different cultures that will surely dazzle and delight. You can look forward to traditional favorites plus new, unique and exciting entries along the parade route. 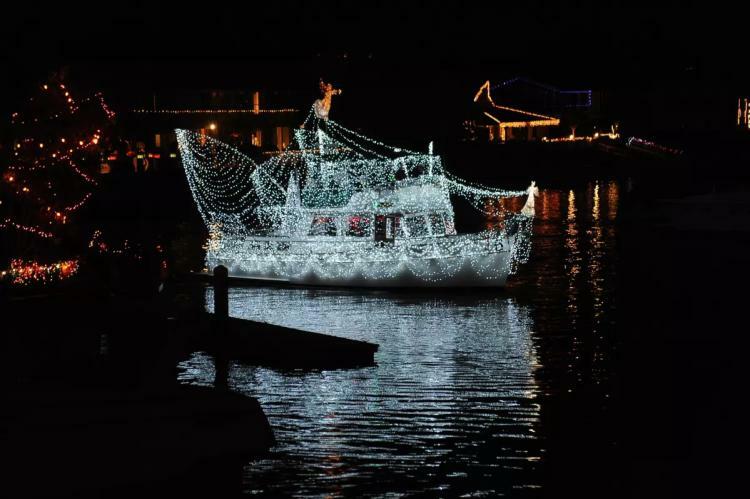 Revel in the beauty of thousands of lights and animated displays on brightly decorated homes, docks, decks and boats on this 45-minute narrated boat tour through the waterways of Huntington Harbour. Cruises depart the dock at 5:30 p.m., 6:30 p.m., 7:30 p.m. and 8:30 p.m. Reservations are a must. Be prepared for rain or shine. 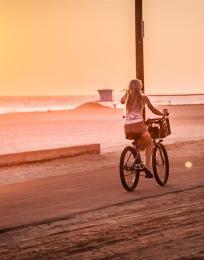 Plus, dress warmly as December evenings can be chilly, even in Southern California. 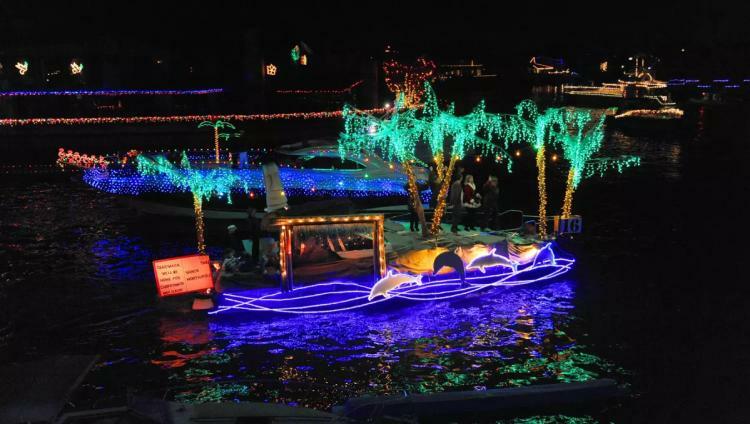 Feast your eyes upon even more holiday lights on a 70-minute cruise down additional waterways and intimate narrow channels in Huntington Harbour. Tour Huntington Harbour homes and make a secret stop to see amazing decorations up close. Sip on a glass of champagne or cider while listening to Christmas carolers. Dinner follows at the “members only” Huntington Harbour Yacht Club. After dinner you’ll get “front of the line passes” to your boat. You will also have the option of additional social time in the yacht club bar. 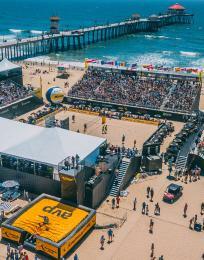 Parking: Shuttles to the cruise leave from the Huntington Harbour Mall parking lot, 16889 Algonquin Street, Huntington Beach, CA 92649. 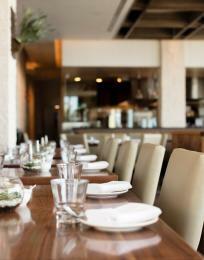 Arrive at least 15 minutes early to accommodate shuttle transportation time.